Many of you may have already seen the photograph above, of an albatross carcass full of undigested plastic junk. 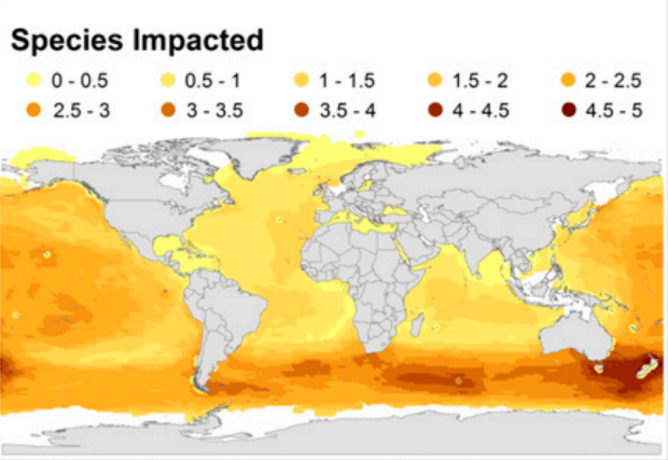 But how representative is that of the wider issue facing seabirds? To help answer that question, we carried out the first worldwide analysis of the threat posed by plastic pollution to seabird species worldwide. Our study, published today in Proceedings of the National Academy of Sciences, found that nearly 60% of all seabird species studied so far have had plastic in their gut. This figure is based on reviewing previous reports in the scientific literature, but if we use a statistical model to infer what would be found at the current time and include unstudied species, we expect that more than 90% of seabirds have eaten plastic rubbish. Our analysis of published studies shows that the amount of plastic in seabird’s stomachs has been climbing over the past half-century. In 1960, plastic was found in the stomachs of less than 5% of seabirds, but by 2010 this had risen to 80%. We predict that by 2050, 99% of the world’s seabird species will be accidentally eating plastic, unless we take action to clean up the oceans. Perhaps surprisingly, we also found that the area with the worst expected impact is at the boundary of the Southern Ocean and the Tasman Sea, between Australia and New Zealand. While this region is far away from the subtropical gyres, dubbed “ocean garbage patches”, that collect the highest densities of plastic, the highest threat is in areas where plastic rubbish overlaps with large numbers of different seabird species – such as the Southern Ocean off Australia. Seabirds are excellent indicators of ecosystem health. The high estimates of plastic in seabirds we found were not so surprising, considering that members of our research team have previously found nearly 200 pieces of plastic in a single seabird. These items include a wide range of things most of us would recognise: bags, bottle caps, bits of balloons, cigarette lighters, even toothbrushes and plastic toys. Seabirds can have surprising amounts of plastic in their gut. Working on islands off Australia, we have found birds with plastics making up 8% of their body weight. Imagine a person weighing 62 kg having almost 5 kg of plastic in their digestive tract. And then think about how large that lump would be, given that many types of plastic are designed to be as lightweight as possible. The more plastic a seabird encounters, the more it tends to eat, which means that one of the best predictors of the amount of plastic in a seabird’s gut is the concentration of ocean plastic in the region where it lives. This finding points the way to a solution: reducing the amount of plastic that goes into the ocean would directly reduce the amount that seabirds (and other wildlife) accidentally eat. 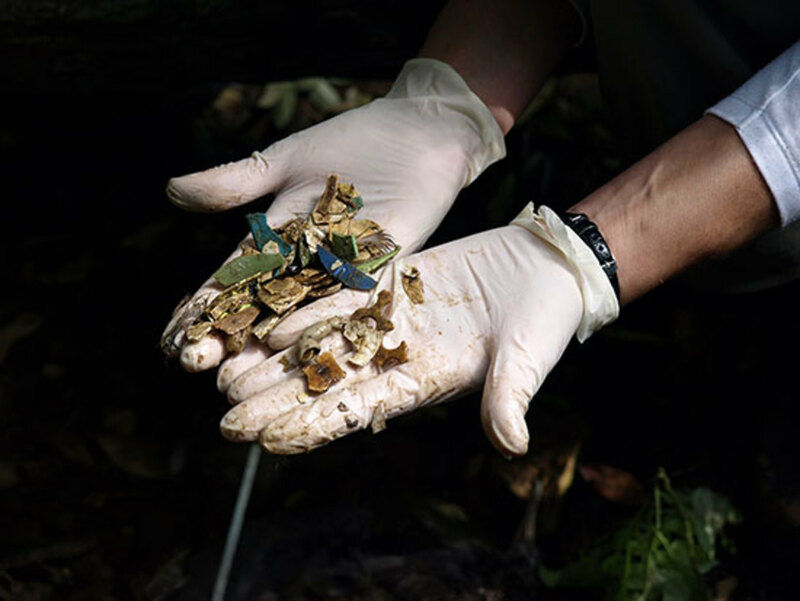 That might sound obvious, but as we can see from the stomach contents of the birds, many of the items are things people use every day, so the link to human rubbish is clear. Our study suggests that improving waste management would directly benefit wildlife. There are several actions we could take, such as reducing packaging, banning single-use plastic items or charging an extra fee to use them, and introducing deposits for recyclable items like drink containers. Many of these types of policies are already proving to be locally effective in reducing waste lost into the environment, a substantial portion of which ends up polluting the ocean. One recent study of industrial practices in Europe found that improved management of plastic led to a clear reduction in the number of plastic items found in seabirds in the North Sea within a few decades. This is encouraging, as it suggests not only that the solutions are effective, but also that they work in a relatively short time. Given that most of these items were in someone’s hands at some point, it seems that a simple behaviour change can reduce a global impact to our seabirds, and to other marine species as well. This work was carried out as part of a national marine debris project supported by CSIRO and Shell’s Social investment program, as well as the marine debris working group at the US National Center for Ecological Analysis and Synthesis, University of California, Santa Barbara, with support from Ocean Conservancy.